Counting down to November 18, 2017, the day the Indigenous People of Biafra, IPOB, shall boycott Anambra governorship election in total rejection of the inorganic and artificial union with the Nigerian State. The following (IF) shall be considered as propellers to a successful election boycott. If you had lost your father, mother, brother, sister or any of your relations, close associates or even friends from 1945 to 2017, in any part of Nigeria especially the North, Biafra genocide 1967-70, violent invasion and killing of IPOB family members in a prayer meeting at National High School Aba, Onitsha Headbridge, 30th May, 2016, Biafra fallen Heroes Remembrance Day, IPOB-Trump solidarity rally at Igweocha(PH), Operation Python Dance at Afara-Ukwu Ibeku and Aba in Abia state. If you are not enjoying affordable and quality even free medication, education, portable drinking water, good roads, infrastructural developments, steady power supply, good business environment and economic developments and opportunities. If your water have been polluted and your environment degraded by oil spillage. Your land produces the black gold that feeds Nigeria but when you take a cup of it, they send their Islamic killer squads after you and refer you as a militant. If you had lost your child, husband, wife, brother, sister or friend because of bad, ill-equipped and dilapidated hospital facilities or even inability to pay hospital bills. If you cannot pay the school fees of your children, your children are hawking sachet water, soft drinks, oranges, bananas, groundnuts, chin-chin, okpa, plantain-cheese, aki-na-ukwa, akamu-na-akara, and all other kinds of petty hawking busineses when they ought to be in school studying. If 50% of your income goes to your landlord on house rent, 30% goes to the purchase of petroleum products such as Kerosene, Fuel or Gas and you cannot even afford three square meal in a day. If you are a graduate roaming the streets with bent shoes, searching for jobs that are not there, sweating out for years yet no job seems to be coming your way, or perhaps, you have been denied a job opportunity because you are not Hausa/Fulani or Yoruba whom you are even more qualified compared to. lf you have been subjected to pay many unnecessary taxes in your business place (and increased the price of your goods and services to make up), your shop has been bulldozed down or rather demolished with your goods inside without prior notice from the government. If you have a seaport at the back of your house but have been subjected by the Nigerian government to traveling as far as Lagos State in Yoruba land to clear your imported goods. If you own a car or you are a motorist, a commuter or a transporter, importer or exporter, you have been extorted, intimidated or robbed by the Nigerian police, custom, army, navy, civil defense, immigration, road safety corps and even touts roaming the roads with illegal police or as a result of insecurity in the country. If your Biafran brother or sister have been killed, raped or their houses razed down by Fulani herdsmen (the 4th deadliest terrorist group in the world), Boko Haram chased you away from Northeastern Nigeria. If you yearn for a better living, a better life for yourself, your children and your generation unborn and above all, when you fight for your inalienable rights and all above that rightfully belongs to you, they label you a terrorist. 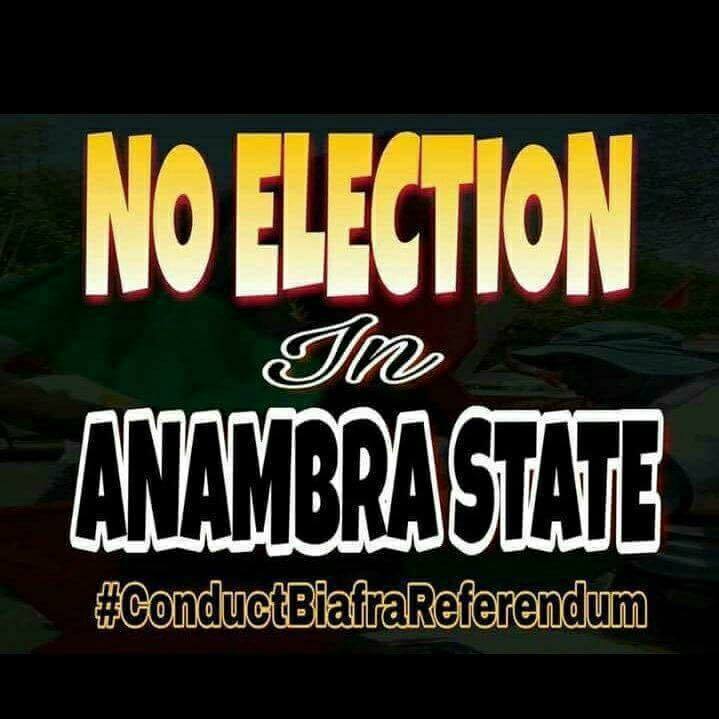 We must collectively boycott Anambra election on 18th November 2017, and any other election organised by Nigerian government in any part of Biafra land until a referendum is conducted to set us free.